A buzz is brewing in Scotland about this fantastic beer from the Isle of Skye Brewery. Known in Scotland as “Cuillin Beast,” this deep, dark ale is rich, beguiling, and just a wee bit ferocious. Legend has it that the great warrior of Celtic legend, Cuchulain, was oft accompanied by a fierce dog-beast that was said to have once wandered the jagged mountains of Skye . . . and so it is that this fine ale takes its name. 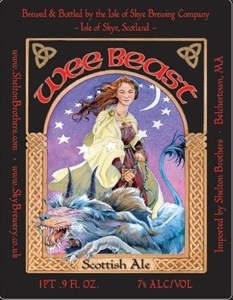 The illustration for the Wee Beast label was painted by Massachusetts artist Gary Lippincott.